Is there any Advantage to be gained from a Scheduling system? Modern ERP systems often contain a scheduling component, sometimes companies have simple scheduling tools custom made internally, perhaps as simple as a few Excel-sheets or in the most basic case, a Mr. Jones in the factory-office who's been doing it for eons with a pen and paper. In some cases, these are really all that's needed. Then, perhaps it is time to get Mr. Jones some help from systems that's been solving these problems for over twenty years. Having all the information about current processes and jobs available, to everyone and in a quick-access manner, is vital to ensure open access and accountability. Many times (if not mostly) people neglect to attend to problems, not because they are lazy or unwilling, but because they didn't know about it in time, or neglected to find out due to difficulty in accessing the information. If someone can see that a job in their responsibility field needs attention, she or he is likely to attend to it (moreso if everyone can see it). Seeing that there is a problem is of course only half the battle - Seeing it as soon as it happens, and immediately understanding what exactly the problem is will determine the speed with which people can attend to the problem. - Can all people see the entire process? - Can they do so easily? - Are problems flagged visibly and instantaneously? - Are the flagged problems clear and descriptive enough to be easily understood? 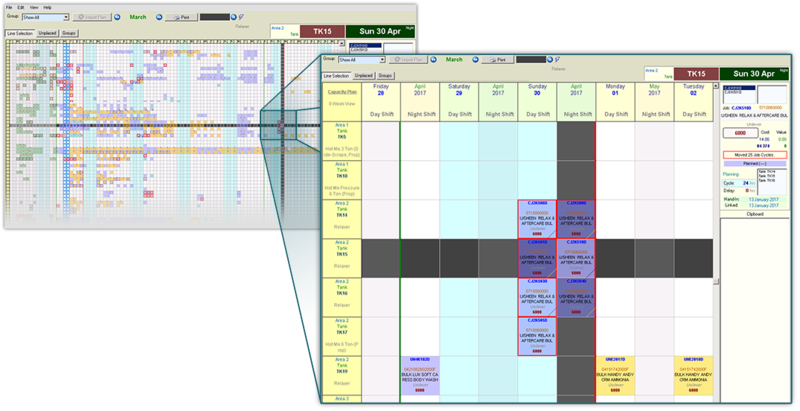 - Can jobs be scheduled, moved or re-scheduled with ease or perhaps even automatically? - Are flow constraints (capacity, maintenance, etc.) clear and easily visible? 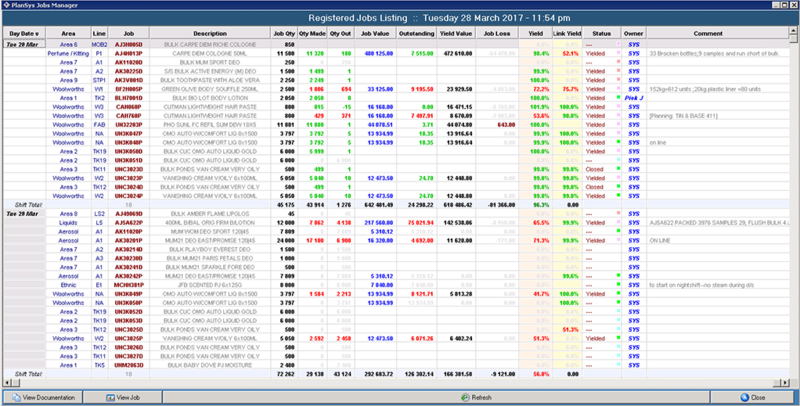 - Can managers easily see overviews of achieved yields and times, or highlight candidates for improvement? These are all very important questions, and if you can't answer "Yes" convincingly to all of them, chances are your people lack the tools to manage the process as efficiently as you would like. During presentations people often ask: "What do you mean here by 'efficiently'?". It simply means that the efficiency of any process is measured by the amount of resources put into it, vs. the amount of product coming out of it. To improve efficiency you need to either produce more, or use less resources. In manufacturing processes, the "Human" resource (aka: Time spent on it by people) is often a very large (if not the largest) input resource, which means that being able to lower it by a good margin will increase efficiency considerably. We know what is needed - How does a RIFIN scheduling system solve it? Everyone has easy access to see all schedule information, Job information and processing statistics. Of course stringent access-control allows only specific people to schedule, change or update information with respect to their individual roles, but everyone can see what is going on, nobody is left in the dark. Large-format factory displays (LED panels or simply large screens) to make processing statistics and information visible in any open area. Multiple User Log-Ins. You may log in from any station on the network without being kicked out from another. PlanSys doesn't limit the amount of simultaneous Log-Ins, nor the amount of users (other than when managing high Server-load). We will never bill you per user - if it's your system, everyone in your business should be able to use it and see the entire processing schedule. 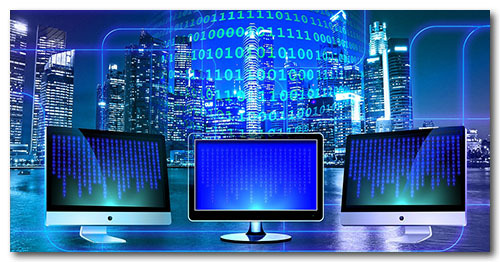 We found one of the most valuable properties of such systems is to provide visibility to all, a property that is directly contradicted with limiting the number of log-ins or users, as is the case in almost every other system out there. 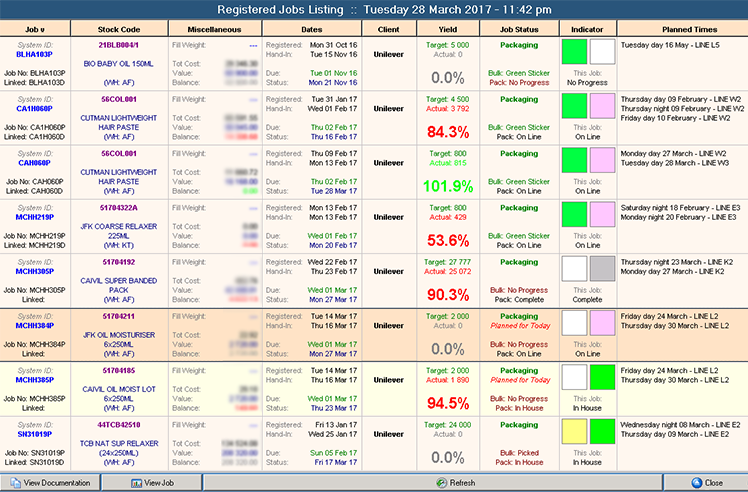 Making information easy to read, finding the right balance between clustering relevant information and highlighting important bits so that anyone can, with a single glance, tell exactly where in the process a job is, how healthy a job is or if something is wrong, what that might be. The ability to see an overview of the entire plan for the next few months for all manufacturing/production lines in the factory (or section of it) is paramount to fully determining exposure to and dependence on those capacity factors. Note: The colours and markers both are fully configurable. At this factory, the "VC" marker indicates a client-validation batch, Yellow jobs are being picked, green jobs are ready to go and pink-ish jobs are being made on the line, and that red block is a problematic Job. Gray jobs are done. Different zoom levels will clear up detail and relax congestion of the visuals, but it allows quick transformation between "Overview" and "Detail" style viewing. 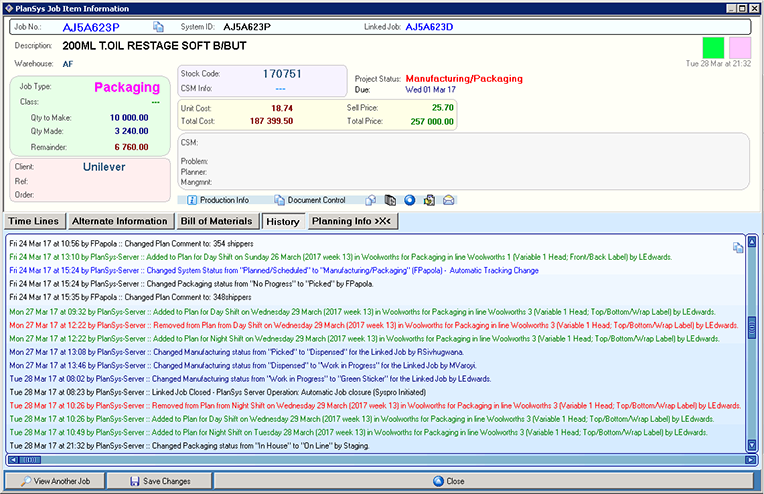 Full information on the production line or Job detail is, as always, just a click away via context menus or quick-access buttons. The Plan may also be printed in part or in it's entirety, making it easy to share with factory floor personnel that might not have access to computer terminals, or to discuss a specific problem area in a meeting. It's all good to be able to schedule something to happen, but did it happen? Did it happen correctly and fully? Was there any problem, and if so, what was it? Some of the RIFIN people have been studying and improving (or trying to!) 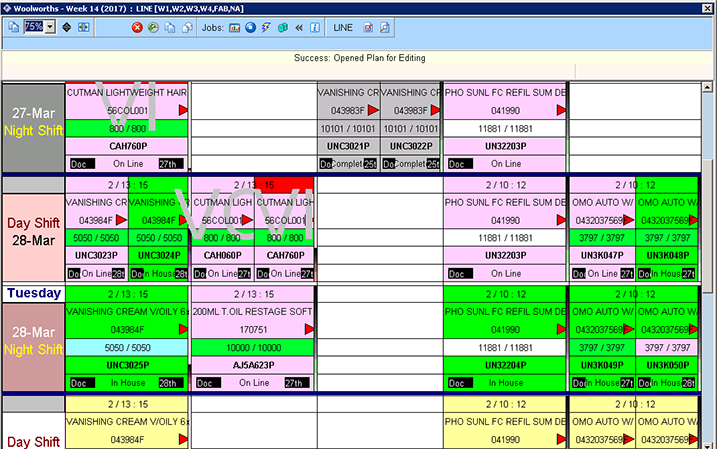 manufacturing and production scheduling for more than 20 years (since the late 90's). 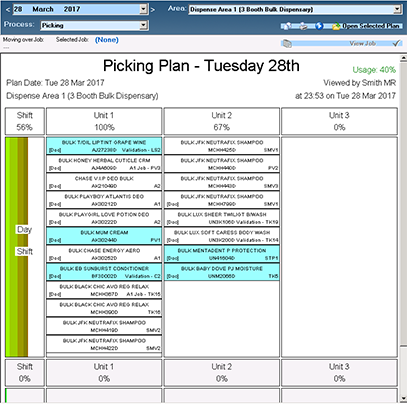 PlanSys (in stand-alone system form) started life in early 2003 at a client who, after a very successful implementation of a different system, asked us to assist with the nightmare that was Scheduling. We learned as much from them as they did from us, they were experts at difficult scheduling, but had to do so on archaic systems. A long-term evolution began of achieving goals, then refining and re-thinking scheduling behaviour, from all of the product's, the factory's and the human's perspectives. Seemless integration with main-stream ERP systems and later with on-line functionality became design goals. More clients with similar needs came on-board, and later clients with widely different needs. The system was re-designed from the ground up in 2009 to accommodate all these ideals. 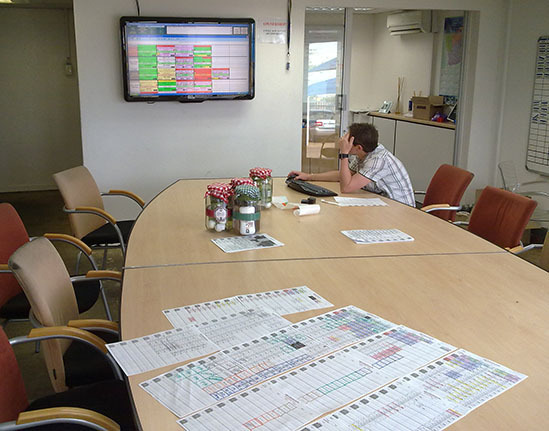 Seven years later, in 2016 another overhaul started, now with the newest available technologies, the cumulative experience of the RIFIN systems architects, and clients old and new, PlanSys has evolved to become possibly the best scheduling system available anywhere - at least as far as manufacturing and production-line goods factories are concerned. Let us know (by clicking the link below) if you think there is room for improvement with your Scheduling and would like to see what the future could be.